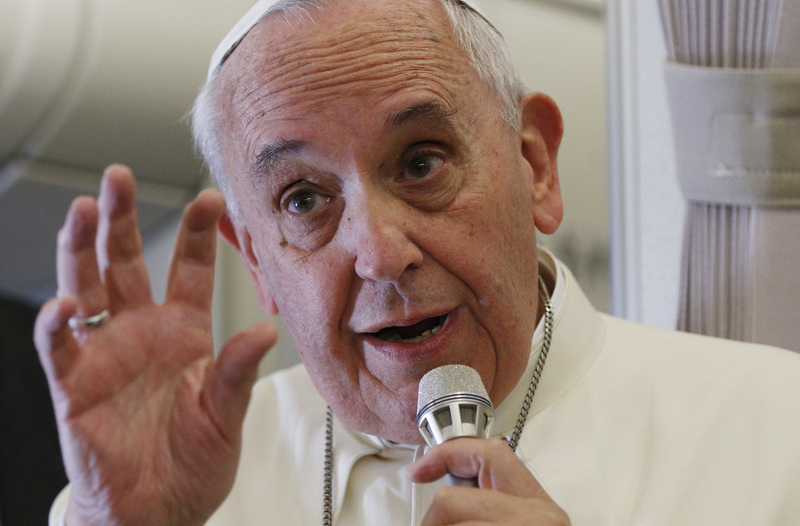 Families who have lots of children do not cause poverty, Pope Francis said. The main culprit is "an economic system that has removed the human person from its focus and has placed the god of money" as its priority instead, he said Jan. 21. The pope dedicated his general audience talk to a review of some of the highlights from his visit to Sri Lanka and the Philippines Jan. 13-19. Speaking to some 7,000 people gathered in the Paul VI audience hall, the pope recalled his second apostolic journey to Asia after visiting South Korea last August. He said he wanted to encourage Catholics in their faith and missionary zeal as well as promote interreligious dialogue, peace, unity and social development by highlighting the important role families and young people should play. Meetings with families and young people in Manila were a major high point on his trip, he said, because they showed how "healthy families are essential to the life of society." "It gives consolation and hope to see so many large families that welcome children as a true gift of God. They know that every child is a blessing," he said. He criticized as "simplistic" claims that high birth rates caused poverty. Rather, an economic system that creates "a culture of disposal," where men, women and children are excluded "is the main reason for poverty, not large families," he said to applause. He reiterated the importance of showing "the beauty of the family in God's plan" and defending it from the many threats and new forms of "ideological colonization that attack its identity and mission." On the flight back from Manila to Rome, the pope told journalists Jan. 19 that "for the people who are the poorest, a child is a treasure" and "God knows how to help them." But he also underlined that being a good Catholic did not mean married couples "had to be like rabbits," that is, have children "one after the other" without any sense of responsibility. Through dialogue with each other, their pastors and church groups, each couple can seek to discern its own "parental responsibility" and recognize there are "licit" means, through natural family planning, to be "prudent" and generous in welcoming life, he said on the papal plane. In his audience talk Jan. 21, Pope Francis said another important message he highlighted on his trip to Asia was that "taking care of the poor is an essential element of our Christian life and witness." This entails "refusing every form of corruption because corruption steals from the poor and demands a culture of honesty," he said to applause. The main motivation for his trip to the Philippines was to meet with survivors of Typhoon Haiyan in Tacloban and "pay homage to the local people's faith and ability to recover," he said. He again prayed for an "innocent victim" of local storms -- the 27-year-old Catholic Relief Services worker, Kristel Padasas of Manila. She had worked with a recovery project for victims of Typhoon Haiyan and died Jan. 17 after the papal Mass in Tacloban when high winds blew over scaffolding. Meanwhile, he said the importance of reconciliation was the focus of his trip to Sri Lanka, which is seeking to rebuild unity after its 26-year-long civil war ended in 2009. The nation's different religions have "a significant role" to play in fostering a spirit of cooperation and helping bring healing with "the balm of forgiveness," the pope said. Dialogue, respecting human dignity and involving everyone in seeking solutions and promoting the common good are critical, he said he told government officials. But the high point of that trip, he said, was canonizing "the great missionary," St. Joseph Vaz. The pope said he hoped the new saint's "holiness and love for the other would continue to inspire the church in Sri Lanka, in its apostolate of charity and education." He said St. Vaz is a model for all Christians who are "called today to propose the saving truth of the Gospel in a multireligious context, with respect for others, with perseverance and humility." Before the general audience, in the lobby of the Domus Sanctae Marthae residence, Pope Francis received two lambs who had been blessed earlier in the day in Rome's Basilica of St. Agnes Outside the Walls, where they were placed on the altar over the martyr's tomb. Every year on the feast of St. Agnes, the pope blesses two lambs raised by Trappist monks on the outskirts of Rome. The wool of the lambs blessed on the feast day is woven by a community of nuns and becomes the fabric for the "pallium," a circular stole, which the pope gives each June to new archbishops from around the world.